Before you get the wrong impression, let’s get one thing straight. The eye has many focal lengths. It simply doesn’t behave like either a prime or a zoom lens – it does not have a counterpart in the camera world. As we have seen earlier, the 35mm equivalent focal length of the eye based on its optical geometry is about 16.67 to 22.22mm. Since this result is based on the optical design of the eye, let’s call this the optical focal length. Since the crop factor of the eye is about 0.75, the 35mm equivalent optical focal length is between 21mm to 32mm. Therefore, the 35mm equivalent focal length of the eye using this method of calculation is about 8mm (this also takes into account the eye’s crop factor, as discussed here). This focal length can be called the angle of view focal length. I have two more focal lengths to share with you! lr works out to be 32.81mm and br works out to be 17.54mm. This approximates a sensor between full frame 35mm and APS-H.
From this, we can deduce that the approximate 35mm equivalent focal length of the Central retina is about 8mm x 1.76 = about 10mm to 14mm. Let’s call this the central retina focal length. The catch is, when we look at images on a 35mm sensor camera made with a 14mm lens, we don’t feel it represents our eyes’ perspective correctly. The rest of this post is my explanation, possibly my whim or fancy, of why this is so. 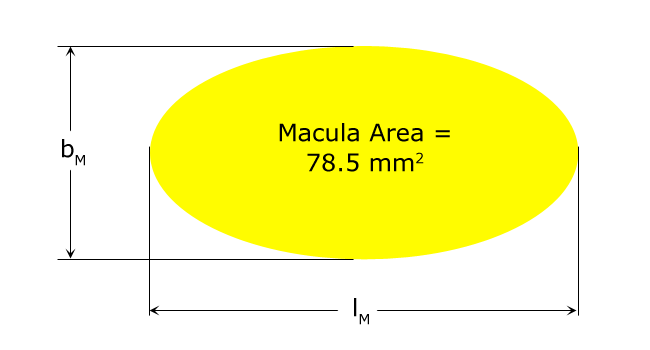 The area of the macula is 78.5mm2. For the sake of simplicity, assuming the aspect ratio is 1.87:1, the macula sensor equivalent is 13.7mm x 7.3mm, which approximates a Nikon CX sensor! The crop factor is 4.3x (36/13.7 (horizontal) = 2.63; 24/7.3 (vertical) = 3.38; diagonal = 4.3). From this, we can deduce that the approximate focal length of the Macula is about 8mm x 3.8 = about 35mm. One more. The Fovea is about 1mm2 in diameter, and performing the same calculation we get the equivalent sensor size of about 2.73mm x 1.46mm, which gives us a crop factor of 21.1x (36/2.73 (horizontal) = 13.19; 24/1.46 (vertical) = 16.44; diagonal = 21.1). The focal length of the Fovea works out to be 8mm x 21.1 = 169mm. Finally, the Foveola has an area of 0.1256mm2, with a sensor size of about 0.55mm x 0.29mm, which gives us a crop factor of 105.5x (36/0.55 (horizontal) = 65.45; 24/0.29 (vertical) = 82.76; diagonal = 105.5). The focal length of the Foveola works out to be about 8mm x 105.5 = 844mm. The equivalent angle of view for this is about 2o to 3o. This corresponds perfectly to observed values. 8mm to 800mm. Which one to choose? There isn’t one correct answer, I’m afraid. Think of the brain as a supercomputer that can take in a picture with many focal lengths and process them in real-time. The Macula is a natural sun-glass for the most important part of the retina, and this is a good indicator of what our biology thinks is important. The Optical focal length is also about 35mm – the eye is built for it! 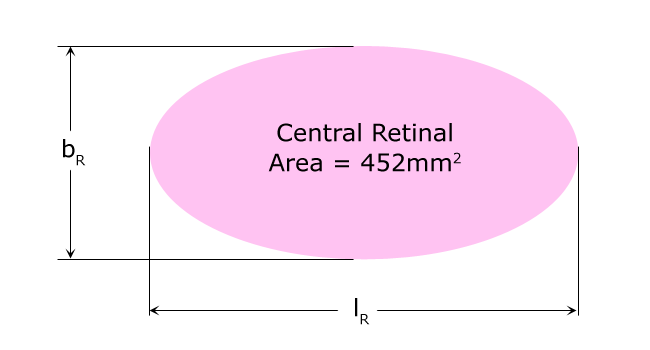 The optical focal length of the eye is about 32mm in 35mm equivalent terms. In practice, the focal length of the eye varies from 8mm to 844mm in 35mm equivalent terms. When you are talking about 35mm equivalent are you referring to a 35mmDSLR or a 35mm film camera which I believe is similar in size to a APSC sensor in the DSLR? geeohgeegeeoh wouldn’t be fun otherwise! I won’t for a minute disagree the fine Drs maths add up. I suspect the photography wizards worldwide aren’t going to stop recommending a 55 as a ‘normal’ lens either! geeohgeegeeoh sure…I’ve learnt that, too. What one ‘feels’ is not always equal to what ‘is’. I was told a 55mm lens gets you the best effect of ‘what I took is what I see’ at arms length. I find a 35mm widens the view. So I can’t entirely come at 35mm is the most natural, because .. well .. because. Ok. so I did some LMGIFY and indeed, a lot of people think 50-55mm is the ‘natural’ -not 35.